Last weekend I visited the luxury Imagine Day Spa and Health Club at Orton Hall in Peterborough with my partner for our anniversary. We wanted some relaxing time as well as a chance to unwind together for our celebration. 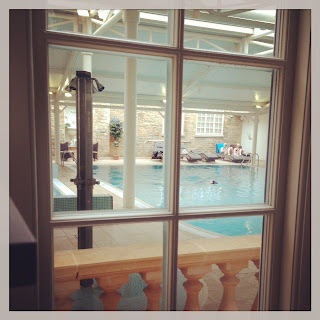 We picked this spa as it looked like the ideal place to get away from it all. It is a treasure, hidden in 20 acres of mature parkland in the village of Orton, Longueville. The A1 took me all the way there. 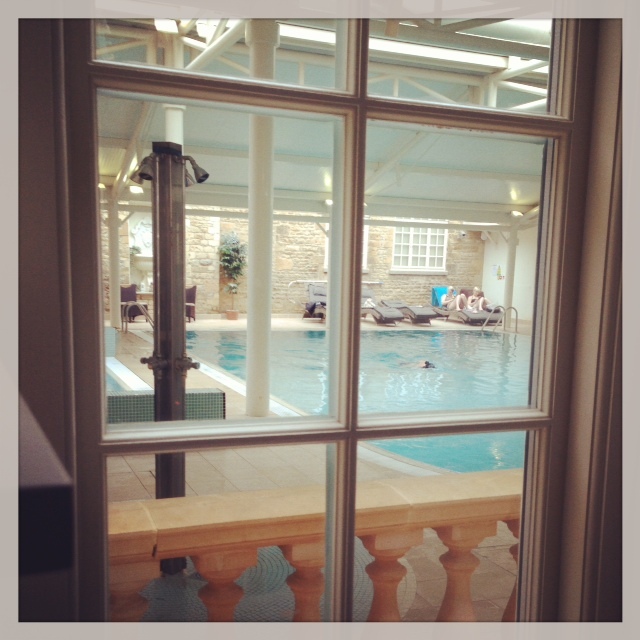 I work in PR and often find that London Day Spas often feel like I am working and all the chill out time gets taken away by the underground train journey. The treatments that we booked were the couple’s room for a Raindrop Massage each and access to the spa and Serail Mud Chamber. The spa is easily accessible and only about 45 minutes from Essex or Hertfordshire. They also have a hotel that you can stay at called Best Western Orton Hall Hotel and Spa, which I didn’t stay at but looked really cosy, country pub-like and full of character. It used to belong to the Marquesses of Huntly, so definitely worth a visit if you want to team it with the spa as it has romantic 4 poster beds and a lovely Huntly restaurant. There is also a pub called the Ramblewood Inn if you want to have a well-deserved glass of red or tasty home-made food after your treatments beside the spa and hotel. The Product House that Imagine Spa use are BABOR, which is a high quality spa brand from Germany. I love the way BABOR transforms cutting edge science into skincare. A key hallmark of their range is the respect they show to nature and its precious active substances. They use raw materials that are obtained from controlled organic cultivation and are based on renewable resources. They don’t use any PEGs, Synthetic silicone oils, mineral oils that irritate the skin, paraffin derivatives or animal-based raw materials. The creams and oils just sink into your skin so easily. This brand was used in our Raindrop massage. Upon arrival you go to a friendly reception team to check in and then take a seat in a lounge where hot refreshments are served. I liked the way the receptionist actually came over to us to explain the treatments and take the time to go through our contraindications form with us. It was more personable then being called up by name to go through. From there, we were introduced to our two therapists Jessica and Chloe. 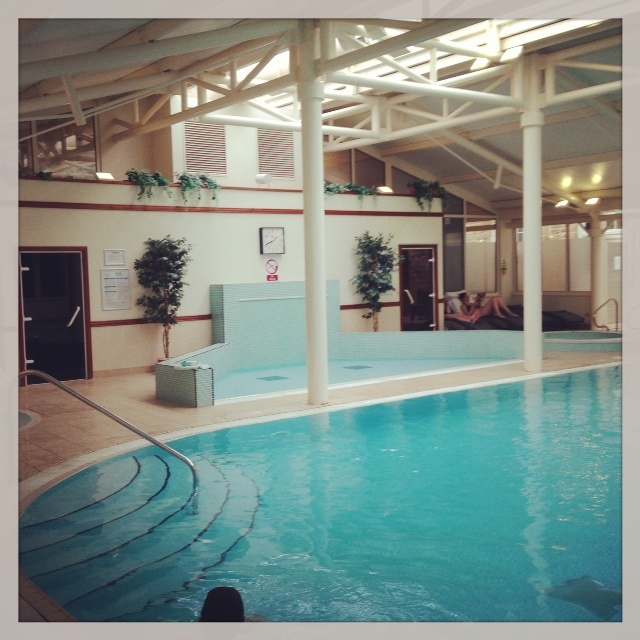 They showed us the changing rooms and told us to relax in the lovely spa area before being called to our massages. The changing rooms have an allocated locker if you have booked a treatment, with a coin already in it to lock it. The lockers are large and spacious if you want to bring a large bag down. 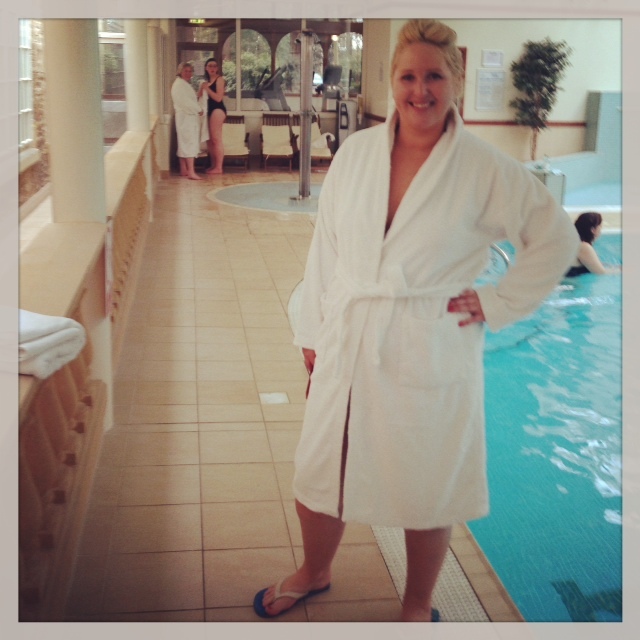 There is a fluffy white robe for you to get into, as well as a lovely fluffy white towel to use in the spa. I would recommend though that you take a pair of flip flops to walk around the wet pool areas. The changing room has hairdryers and mirrors at the sink for your make-up. It is quite small so if you come in a large group, it might be better for some people to get changed in stages. In the spa area we chilled out in the relaxation lounge area that had comfy lie back beds, herbal tea drinks and plenty of magazines. 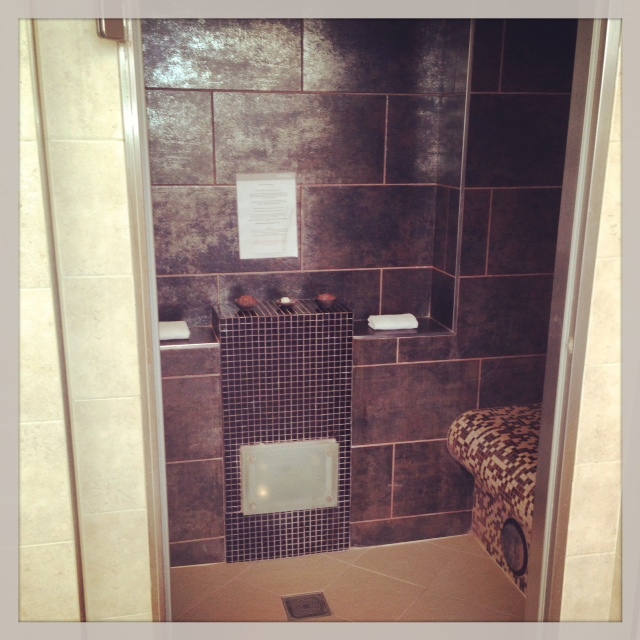 There is also a sauna that is very spacious so you can fully lie down and a steam room that cleared my head. There is a Jacuzzi that is full of fun bubbles and large enough for six people. It was so warm and soothing on my sore back that I didn’t want to get out for a while. 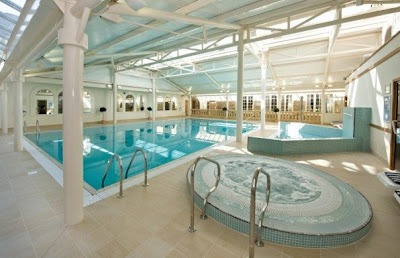 The swimming pool is a large size for swimming some stress relieving lengths. 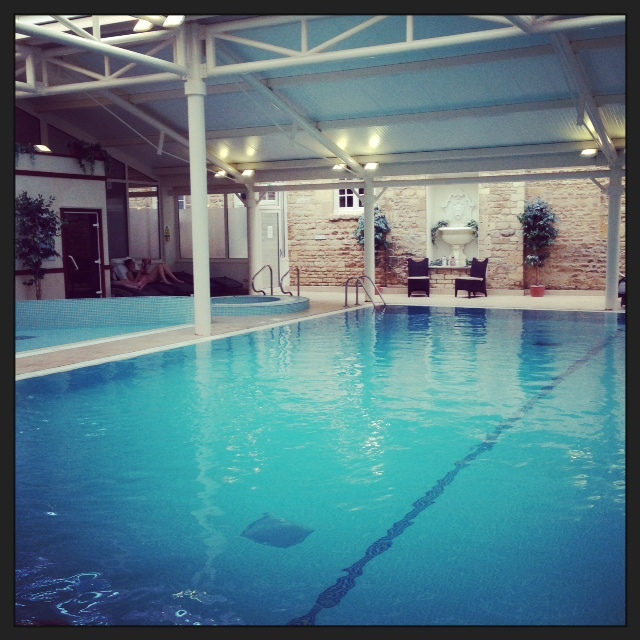 The water isn’t too cold so you can pop in and out of the pool at your leisure. This treatment is an exclusive to Imagine Spas. 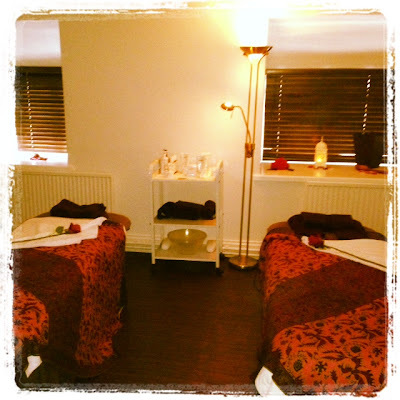 I booked a double massage with my partner and didn’t expect them to put us in a double treatment room which was great as he hadn’t had a full body massage before and wasn’t sure what to expect. It meant that we were not worrying about whether the other person was enjoying it or not and brings you closer together as when we were on the beds we could touch hands if we wanted. We had the Roses room, which was decorated in romantic red covers on the beds with roses and beautifully lit to calm you. Once we had both settled into position we were both asked by our therapists which fragrance out of three, we like the smell of the most. There was an energising citrus smell, a woody uplifting smell and a relaxing Lavender smell. We both felt drawn to the Lavender scent as I need to wind down and be calm when I have a massage. I must tell you that night I slept like a baby so it worked a treat. My therapist Jessica (although extremely petite), had really firm, magical strong hands to click out my back tension. (I asked for a deep tissue massage to get rid of my knots and they will ask you what pressure you want). Ask for Jessica if you want some tough love, as she managed to find tension in my back I didn't realise was trapped in the area it was in. She seemed very skilled in knowing where to massage an wasn't afraid to get stuck into the tough areas. The Raindrop Massage is a warming, relaxing treatment that will leave you feeling as good as you do after walking through tropical rainfall. Jessica slowly dripped the Lavender essential oils along my spine and backs of the legs before performing a full body 60 minute relaxing massage and applying warm compresses. 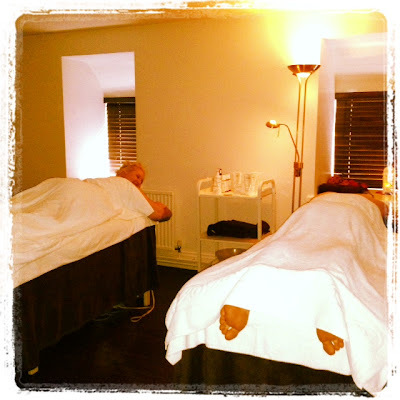 The massage was then applied on the front half of my body as I lay on my back and finished with a scalp massage. The massage is particularly appropriate if you suffer from backache. I actually had to try and wake my partner up after the massage as you can see below he was totally gone. I think he is not as tense as me physically but in mind he finds it hard to switch off and his therapist Chloe was perfect for a first time massage as she was very gentle. See below for treatment price as this was included in our Enrich Experience Package. We decided to combine our massages with the Serail Mud Chamber at the spa. As it was Easter, the idea of the Chocolate mud for your body and Vanilla mud for your face that you could apply yourself sounded divine. Really original, this treatment is best with a loved one or a friend you feel really comfortable with. I would feel a bit uncomfortable on my own as I wouldn't be able to apply the muds on my back and it would seem a lot of waiting for the steam if you were alone. You are taken to a private room away from the spa area that has its own warm shower and mini steam room with heated tiled seats. We were told to shower and then apply the muds to each other and wait for the steam and showers. Because it is private, you can feel more comfortable with things like applying the mud to your areas you might not get out if a whole poolside were in view such as your stomach or cleavage area and men can go for gold applying the mud and not have to worry about looking silly. We all know men secretly love a beauty treatment and nick our face masks! The whole treatment lasted about 45 minutes. We had about three sessions of applying the mud, relaxing in the aroma steam seats an then being showered by the light rain blast of water that came down. The combination of the muds and chalks, steam cleanse the skin leaving it really soft days after, my skin felt so smooth an baby soft, plus I started seeing a lot of deep down blemishes on my face come to the surface and then disappear. This treatment would be great if you were doing a detox as it penetrates your skin deep down. I have only seen this kind of treatment abroad in places like Turkey, so it is great to know you can now get this sort of thing here in the UK now. This is a wonderful treatment that is most enjoyable with a friend or partner. You will apply healing mud, chalk, cleansing salts and mineral oils to your body before you enter the two person serail chamber. During the initial relaxation stage the pleasant healing herbal warmth in the room enables the ingredients to cleanse the skin fast and accelerate toxin removal. The music and gentle lighting ensures you are totally relaxed and after a steam bath, a warm shower removes all the mud to complete your treatment. Your skin will feel as soft as silk and you will feel completely chilled. 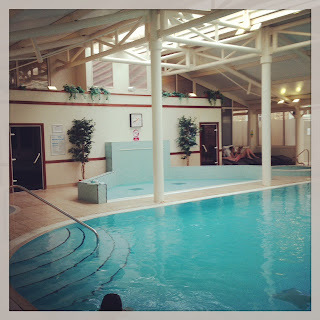 The Imagine Spas are located in different locations around the UK. They offer a range of massages, facials, body wraps, exfoliations and of course the complete look treatments such as manicures, pedicures, make-up lessons. 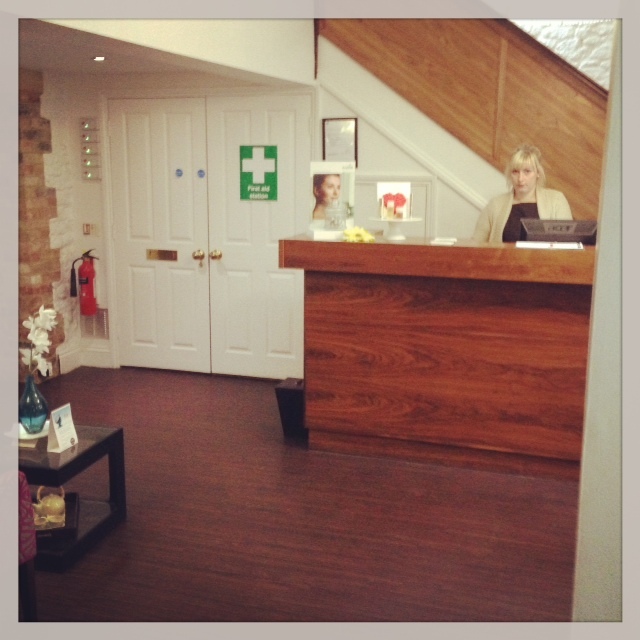 Some of their spas offer waxing, tinting and St Tropez tanning so it would be great for a bridal or group booking. What is different about these spas is that they base your treatments around bespoke time slots catered for your needs so you get the most out of your stay. You book minute time so you can pick and choose what treatments you want as the therapist is booked for all of your allocation time. Their spa packages come in either a half or full day option. You can pick from a Discover Experience, which is ideal for a first time spa goer as you have a 60 min treatment and 420 mins to spend in the spa- Full Day at £99 Weekend (WE) or £89 for Weekday (WD) or a half day, which is a 30 min treatment and 210 mins in the spa. £49 (WD) or £59 (WE). The second package is the Enrich Experience, which helps you make use of both the spa and treatment time by offering you 90mins of treatment and 390 mins in the spa. Full Day is £109 (WD) or £119 (WE). 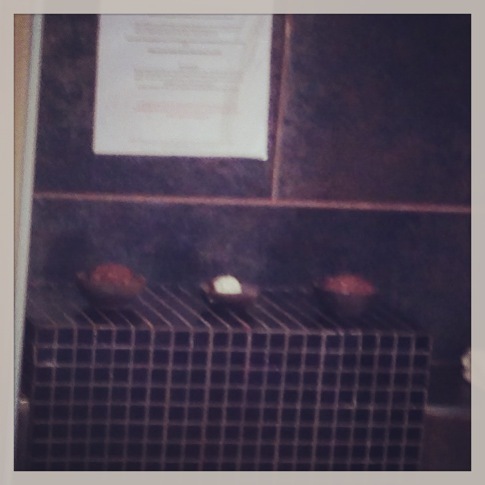 Half Day is 60 mins of treatment and 180 mins in the spa. £79 (WD) or £89 (WE). This is the one that we opted for as we wanted to try the Serail Mud Chamber in the spa as well as have our full hour treatment time. The third option is the Indulge Experience which is only available for a full day at 120 mins treatment and 360 minutes in the spa. £139 (WD) and £149 (WE). If I had more time, I would love to come back for this one. All in all, I really enjoyed this day spa as a quick hideaway I could escape to, with really down to earth staff, a clean spa area that was not overcrowded and the down time to relax properly without feeling you were being sheep herded. I also loved the original elements of the Raindrop Massage and Mud Chamber that made you feel special and treated. 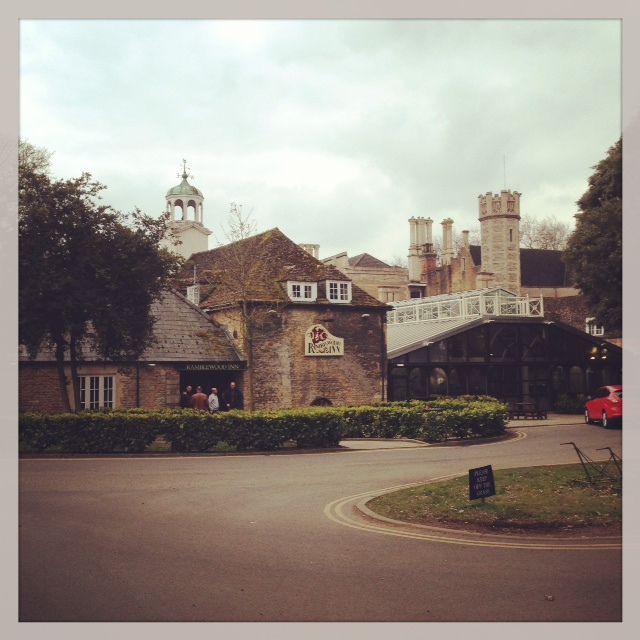 I will be back very soon and would like to try the Cambridgeshire Imagine Spa which I have heard is also lovely.